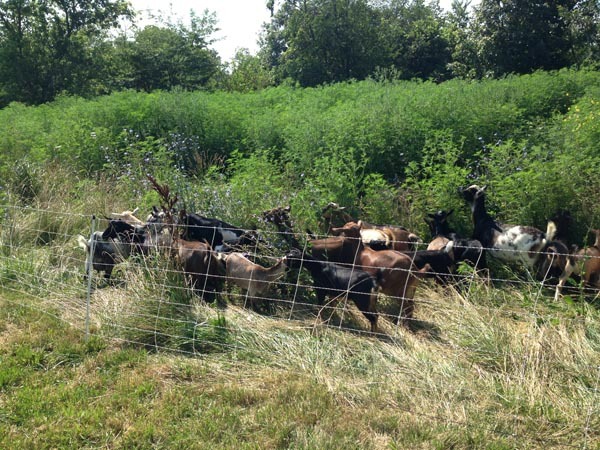 Unless you have a hundred acres for four or five goats, consider rotational grazing. It will make your pasture last longer and reduce the incidence of internal parasites in the goats. Rather than fencing in several acres for the goats and letting them spend the whole grazing season on that space, subdivide the pasture into smaller paddocks. The goats stay on one section of pasture for a number of days before being moved to clean pasture with fresh grass, leaving behind their poop, which contains parasite eggs that will hatch and die without a host. 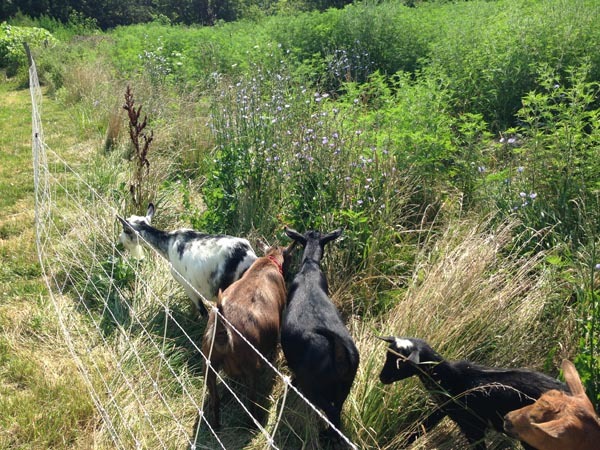 There are a couple of ways you can utilize rotational grazing, and the method you use will depend on the number of goats you have. Four livestock panels can be used to create a 16-foot by 16-foot pen that can be moved every day or two, depending upon how fast the goats eat the grass. 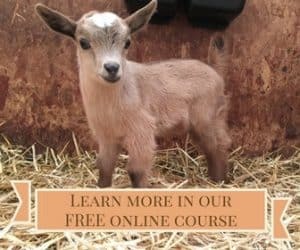 This works well for goat keepers who have an acre or two and only a couple of goats. For those with a larger herd and at least five acres, the grazing area is enclosed with a permanent perimeter fence, and temporary electric fencing is used to subdivide the large fenced pasture into smaller paddocks, through which the herd is rotated. Opinions vary widely on how often the goats need to be rotated to clean pasture, but it depends on weather as well as whether your main objective is pasture utilization or parasite control. For best parasite control, animals should graze an area only once per year, whereas a rotation of every thirty days works if you are only concerned about the best use of the pasture. The height of the grass also plays a role in deciding when to rotate. Someone once said that goats should never eat below their knees. Technically, they are browsers, not grazers, and they prefer to eat shrubs and young trees rather than grass. Because goats have gone through history not eating off the ground, their parasite resistance is not usually as strong as that of cows and sheep, who do eat off the ground. Goats really should not be eating grass down to the dirt. A commonly encountered recommendation is to move goats to new pasture when the grass is about 6 inches tall. Larvae do not have legs, but they can float up on a blade of grass when it is wet. However, without a true means of movement, parasites don’t move very far up on the grass, which is why parasite problems are generally low when goats are consuming grass that is taller. It is a balancing act, though, because when grass gets too tall, it is not as tasty. Rotational grazing allows you to graze other livestock on a piece of land. Because cows and horses prefer grass and goats prefer bushes and small trees and each species has different parasites, cows or horses can graze the paddock just vacated by the goats. Although sheep and goats have the same parasites, sheep prefer weeds, so they can graze a pasture at the same time as goats. This means you will be able to graze more animals on a piece of land than if you only had one species. 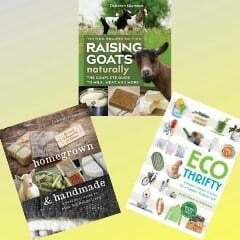 This is an excerpt from Raising Goats Naturally: A Complete Guide to Milk, Meat, and More by Deborah Niemann. Want more details on exactly HOW to do rotational grazing? Check out this post! I am not sure what kind of shrubs you have there but how do you keep your goats from stripping the bark (and killing the shrubs)? First of all, you should never put goats in an area that has been landscaped with anything that you care about. However, the whole point of rotational grazing is to move the goats often enough that it’s actually beneficial for the pasture. If you are rotating them frequently enough, they shouldn’t have enough time to actually kill shrubs. Young trees are very easy to kill because they have a single trunk, so if the goats strip the bark all the way around the young tree will die — and several of them could do that in less than half an hour. But shrubs so not have a single trunk. They have many branches that carry nutrients from the roots out to the leaves, so you’d have to leave goats in an area for a long time for them to be able to do a lot of damage to shrubs. They do eat floribunda roses to the ground, but I’ve never heard of anyone that cared about those. But again, that takes time. My goats are expert at girdling trees, especially fruit trees. They will also go after aspen bark and conifer bark. On occasion they will get out of their pen, find and strip bark from my apple trees with alarming speed . I have put wire mesh around the trunks and lower branches, completely covered smaller trees etc to protect them from the occasional jail break. Similarly they strip bark from choke cherry (which I know is toxic in large quantities) so that is a double whammy…dead trees that we have to clear and goats that are eating things they aren’t supposed to. These are big, 200+ lb goats. Anyway, we have cleared some areas of the choke cherry and will probably do more of that (since that is what dominates on our 3 acres). We have some meadow as well and try to keep the goats in the meadows as we rotate them. It is just a shame because there is a lot of good grass under and around the chokecherries. From experience I know I can’t let the goats have more than a few minutes exposure to the chokecherry. Although they seem to be able to tolerate eating the leaves (also toxic in large quantities) they can’t resist stripping bark and in a single day will girdle several trees. I do have some wild rose on the property and they love that but of course it is in and amongst the cherry. Ah well, clearly we need to move somewhere with better shrubbery!